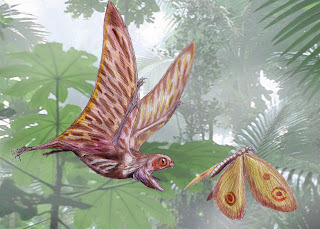 The giant Jurassic lacewing Kalligramma haeckeli being pursued by the small pterosaur Anurognathus ammoni. Reconstruction by Dmitry Bogdanov. Lacewings are a remarkable group of insects. Though not an overly large order, they cover a wide diversity of forms, including large narrow-winged forms superficially not dissimilar to dragonflies (previously covered here), minute psocid-like taxa, species with large mantis-like raptorial forelimbs, and large broad-winged forms that might almost be mistaken for moths were it not for the lack of scales on the wings. One living family, the Nemopteridae, includes species in which the hindwings have developed into long ornamental streamers. But it is to the fossil-record that we must turn to see what were perhaps the most spectacular lacewings of all - the giant butterfly-mimics of the Kalligrammatidae. Though perhaps it is more accurate to say that butterflies are kalligrammatid-mimics, because the kalligrammatids flew through Europe and central Asia in the late Jurassic, at least sixty million years butterflies were even thought of (Grimaldi & Engel, 2005). But while at no time did the two ever share a time-frame, if they could have been brought together the resemblance would have been striking. 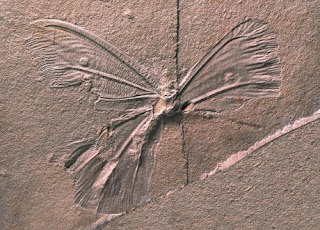 Kalligrammatids resembled lepidopterans even more than did other broad-winged lacewings because their wings were darkly coloured and densely setose, and their fossils even preserve evidence of bold patterns such as eye-spots. Like butterflies, kalligrammatids would have been slow but aerobatic fliers, and must have been a spectacular sight in the Jurassic forests. Fossil of Kalligramma haeckeli, showing how the colour-pattern (if not the colour) of the wings remains discernable. Photo from here. 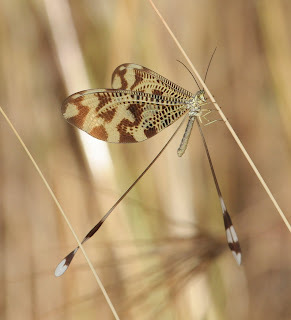 Most lacewings are known for being voracious predators, both as larvae and adults, but kalligrammatids had slender mouthparts that seem to have been developed for sipping nectar, yet another parallel to butterflies. No kalligrammatid larvae have yet been identified (and the extreme morphological differences between larvae and adults of holometabolous insects would make doing so all but impossible), so we have no idea if they shared their parents' genteel habits or whether they remained predatory (either is possible - some modern butterflies have predatory larvae). Specialised nectar-feeders are first recorded from the early Jurassic, though potential nectar production has been inferred from plants as old as the Permian, and many pre-Jurassic insects without obvious specialisations for nectarivory would have still been perfectly capable of feeding on nectar opportunistically if such a resource had been available (Zherikhin, 2002). Nectar is a feature today associated with flowers, and the existence of Jurassic nectarivores has been cited as evidence that angiosperms must have appeared much earlier than the Cretaceous age indicated by fossils (Ren, 1998), but such claims overlook the fact that, even among the modern flora, nectar or nectar-like fluids are also produced by cycads and gnetaleans, both of which (or their stem groups) were present in the Jurassic*. It seems more likely that nectar-feeding insects first evolved in concert with gymnospermous taxa, only to switch to angiosperms as they became the dominant flora. *Besides, the specific fossils described by Ren (1998) come from the decidedly contentiously-dated Yixian Formation of China, and are quite likely early Cretaceous rather than Jurassic. A modern thread-winged lacewing of the family Nemopteridae. 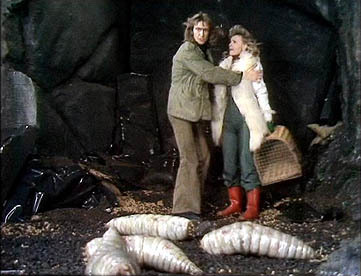 Thread-wings are among the closest living relatives of the kalligrammatids, but other than that there's not much connection between this photo and the post. I just included it because nemopterids are pretty. Photo by Joaquim Maceira. Ren, D. 1998. Flower-associated Brachycera flies as fossil evidence for Jurassic angiosperm origins. Science 280: 85-88. Zherikhin, V. V. 2002. 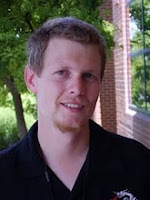 Ecological history of the terrestrial insects. In History of Insects (A. P. Rasnitsyn & D. L. J. Quicke, eds.) pp. 331-388. Kluwer Academic Publishers. Interesting. I should use these in my next Mesozoic illustration. This is really insane stuff. I love the header of your blog. You designed it? What good would it do for a Jurassic cycad to have a Jurassic butterfly-analog land on it and eat its Jurassic nectar-analog? The same good it does a modern cycad or angiosperm - spreading its Jurassic pollen.